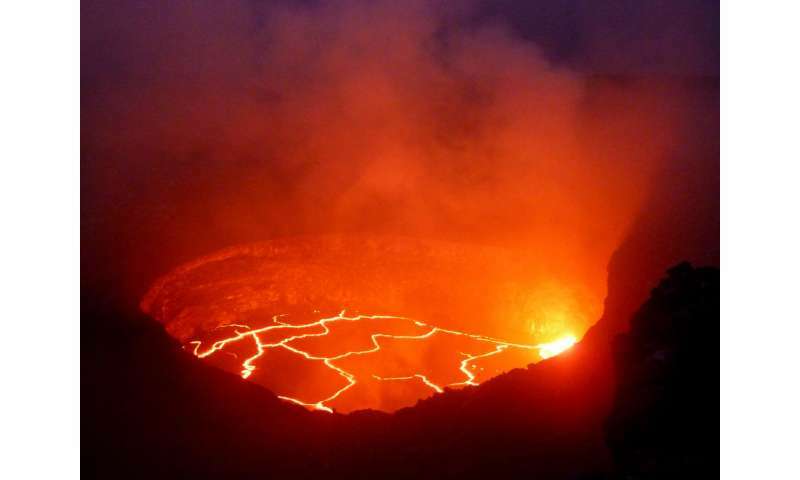 Data was collected by the US Geological Survey across K?lauea in Hawaii, a very active volcano with a lake of bubbling lava just beneath its summit. During a four-year period, the researchers used sensors to measure relative changes in the velocity of seismic waves moving through the volcano over time. They then compared their results with a second set of data which measured tiny changes in the angle of the volcano over the same time period. As K?lauea is such an active volcano, it is constantly bulging and shrinking as pressure in the magma chamber beneath the summit increases and decreases. K?lauea's current eruption started in 1983, and it spews and sputters lava almost constantly. Earlier this year, a large part of the volcano fell away and it opened up a huge 'waterfall' of lava into the ocean below. Due to this high volume of activity, K?lauea is also one of the most-studied volcanoes on Earth. The Cambridge researchers used seismic noise to detect what was controlling K?lauea's movement. Seismic noise is a persistent low-level vibration in the Earth, caused by everything from earthquakes to waves in the ocean, and can often be read on a single sensor as random noise. But by pairing sensors together, the researchers were able to observe energy passing between the two, therefore allowing them to isolate the seismic noise that was coming from the volcano. One to two kilometres below K?lauea's lava lake, there is a reservoir of magma. As the amount of magma changes in this underground reservoir, the whole summit of the volcano bulges and shrinks. At the same time, the seismic velocity changes. As the magma chamber fills up, it causes an increase in pressure, which leads to cracks closing in the surrounding rock and producing faster seismic waves - and vice versa.